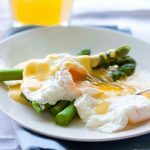 Poached eggs with perfectly blanched Asparagus all complimented with a comforting blanket of Easy Hollandaise is a great weekend low carb breakfast or brunch. I’m slowly but surely making my way back into blogging. And before you ask, I’m not allowed to discuss the reason I’ve been taking a break from my blog. I will soon though and believe me it will be worth the wait. What I can say is that I am going to need a serious holiday after all of this. But back to this post and one of my favourite breakfasts. 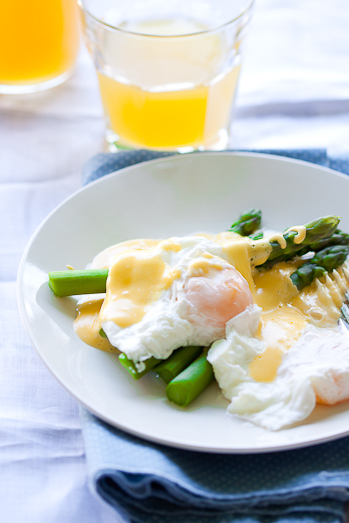 I’ve been making hollandaise with eggs whenever I can this year as it’s always delicious and guests always seem to be impressed with the luscious hollandaise that gently lays over the poached egg, like a comfortable blanket. I have to confess though, the one thing that I can never seem to get perfect is a poached egg. It seems to be my Achilles heal when it comes to cooking. But never-the-less, I always attempt them because I just love the texture of a poached egg. Soft and silky with a just-soft egg yolk. You can of course go the Benedict route and serve the eggs on top of a toasted English muffin topped with fresh rocket (arugula), slivers of parma ham and finally the hollandaise. 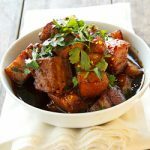 I chose to go ‘slightly’ healthier and served this with perfectly blanched asparagus which are in season in South Africa at the moment and this year they seem to be more delicious than ever. Subtly sweet and most definitely one of my favourite Spring/Summer vegetables. I like to eat this breakfast as is when I want something light yet indulgent but if you want something more substantial, serve it with toasted English muffins. The perfect Weekend breakfast. Start by blanching the asparagus in simmering water for 3-5 minutes until just-tender but still bright green. Remove from the water and place in ice cold water to shock them and to stop the cooking. For the hollandaise, place the egg yolks and lemon juice in a tall container and with a hand blender, whizz until well combined. Slowly pour in the melted butter whilst continuously blending. Move the hand blender up and down to introduce some air and to make sure the butter is getting incorporated thoroughly. When all the butter has been added, taste for seasoning and adjust. 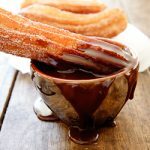 You could also make this in a food processor but the end result won't be as thick and luscious as with a hand blender. When the eggs are cooked, remove from the water with a slotted spoon and allow to drain well. 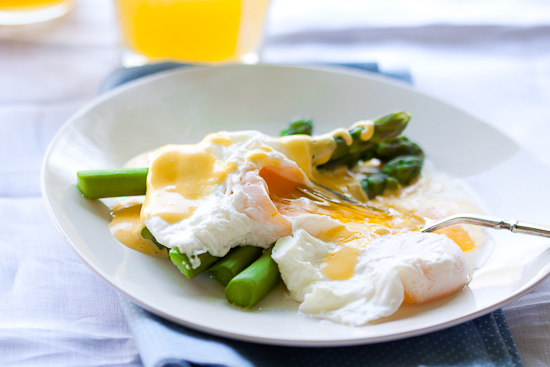 Serve the poached eggs on top of the blanched asparagus and a generous spoonful of hollandaise. 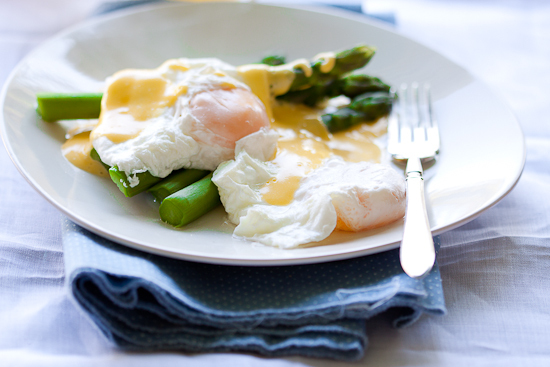 I love asparagus with hollandaise – what a great dish, but I always have trouble with poached eggs, too. Glad it’s not just me. Thanks for sharing! …ek het al verskeie resepte uit die nuwe Sarie Kos gemaak, en wil dit nog pos met ‘n gelukwensing aan jou met daardie wonderlike sjokolade koek met ‘n grondboontjie botter geurtjie!! … maar my tyd was nog heeltyd te min!! Maar ek dink daardie koek gaan heerlik wees!! Sterkte met alles! en hierdie eiers lyk heerlik! !